Hearing loss can occur for many different reasons. Some types of hearing loss may be temporary and medically treatable, while other types are considered permanent. In order to better understand the type of hearing loss you have, it is important to give an extensive case history and perform a thorough hearing evaluation. One common misconception is that increasing sound volume equates to better ability to understand speech. There are certain types of hearing loss where increased volume leads to improved audibility of sounds, but does not lead to better clarity or speech understanding. Listed below is a generalization for the degrees of hearing loss. Most patients exhibit a range of hearing acuity across the different frequencies/pitches of sound; for example, Ms. Smith has a mild hearing loss in the low pitched sounds but a moderate to severe hearing loss in the high pitched sounds. Soft sounds are not heard, especially if background noise is present. At this level, we begin to subconsciously “fill in the blanks” of what our ears miss with visual cues and the context of the conversation. Soft and moderately-loud sounds may not be hearing. Understanding speech in noisy environments becomes more difficult. You may notice that you rely more heavily on looking at someone’s lips when they are speaking. Some very loud noises are heard. Without a hearing aid, communication is no longer possible even with intense effort. Sometimes, with this degree of hearing loss, there are treatment options other than hearing aids (example: cochlear implants, captioned telephones/televisions, additional listening devices). The most common type of hearing loss. The majority of those with hearing loss related to aging (also known as presbycusis) have sensorineural hearing loss. This loss relates to the inner ear. The cochlea is the part of the inner ear that responsible for transforming sound into an electrical signal. This signal then travels along the cochlear nerve to the brain. There are rows of hair cells within the cochlea, which specifically detect various frequencies or pitches. Damage to the hair cells cause hearing to be less clear and can contribute to a distorted sound quality. 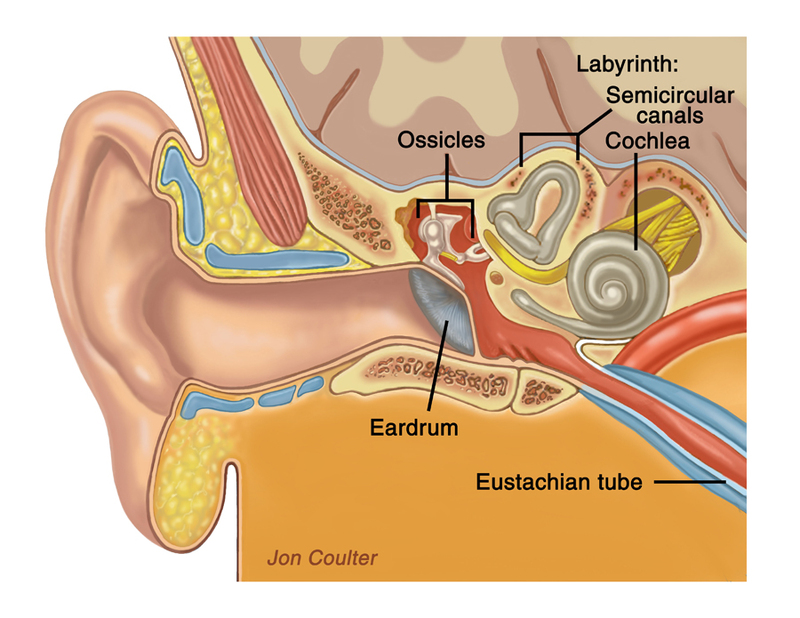 Excessive noise exposure or exposure to toxic medications (chemotherapeutic agents, anti-malarials, and quinine containing medicines) can damage the hair cells of the cochlea and lead to sensorineural hearing loss. Results from anything that impedes the transmission of sound within the ear canal or middle ear. Problems within the outer ear canal that can lead to a conductive hearing loss include earwax, an ear canal infection, and “swimmer’s ear”. Perforations of the eardrum can also cause a conductive hearing loss. A collection of fluid within the middle ear, known as otitis media or middle ear infections, can impair sound travel through the middle ear space causing a conductive hearing loss. A combination of both conductive and sensorineural hearing loss, most commonly this can arise from Otosclerosis. Studies have shown that people with hearing loss who do not utilize hearing aids experience more sadness, fear, and anxiety than hearing aid users. They reduce their social activities, become withdrawn for gatherings and events, and may have trouble with concentration. The use of hearing aids has been shown to increase quality of life, help with maintaining friend/family relationships, and promote more independence and security. Without hearing assistance, the continuous strain to try to focus and follow conversation can lead to fatigue, headaches, and increased stress. If you have any of the above symptoms, we recommend an appointment to obtain a comprehensive audiometric evaluation. Contact us now.